For Rewind customers on all plans except our Free Forever or $5/month Growth Plan, you are provided with the option to run a manual backup at any given day or time, as needed. To run a manual backup, simply go to your Rewind Home Page. Near the top, in the 'Details' section, click "Backup Now". A full backup of your store has now begun. 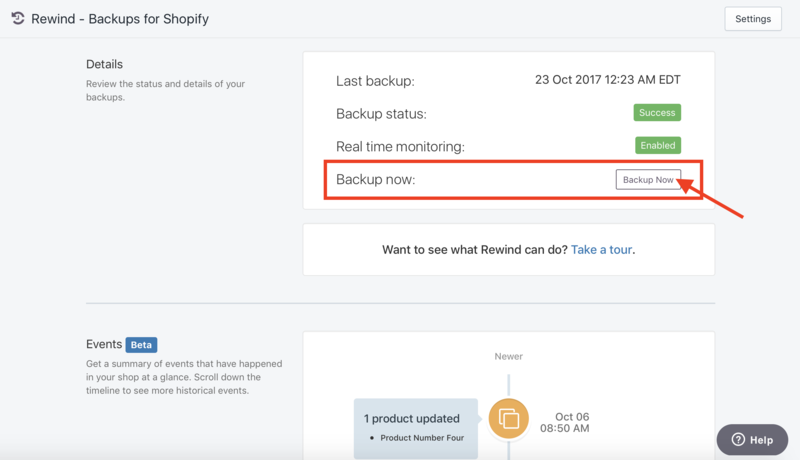 Like with daily, automatic backups and your continuous, real-time backups, manual backups are saved directly to your Rewind Vault once completed. From there, you can view, access, and rewind any of this data if necessary.